There are two basic types of inkjet printer ink: dye-based and pigmented. Dye-based ink is formed using relatively small ink molecules that are completely dissolved in the water that is the usual solvent for consumer inkjet printers. Pigmented inks are formed by microscopic solid particles of coloured material that are in suspension. 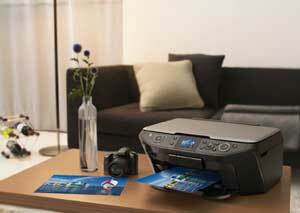 The correct ink type must be used with the correct printer model, otherwise the printer could be damaged. Dye-based inks produce very high-quality results when printed onto micro-porous surfaces. You might think that a porous surface wouldn’t exhibit a shiny glossy finish, but because the porosity is so microscopic, the surface can be almost mirror-shiny. The characteristics of a micro-porous media mean that when dye ink droplets land, they don’t spread very far and they dry very quickly. This preserves the density of the colour and the definition of printed details very well and the glossy shine of the paper is unaffected. This type of surface does not do much to protect the ink and in the early days the combination of dye-based ink and high-shine glossy papers added up to short print lives. But all the printer manufacturers are now claiming print longevity of several decades and even a hundred years if extra storage precautions are taken. One type of photo media that is less fashionable than it used to be is swellable polymer surface photo paper. When inks were less resistant to fading, this type of paper was popular because it absorbed the ink into its polymer surface, sealing it in after drying and so protecting it from oxidation. But there were several drawbacks. This type of paper needs to be handled with care straight after printing and can take hours to dry completely. The polymer coating is not as resistant to water spillage or physical abrasion compared with micro-porous papers and the glossy finishes are not as shiny as micro-porous papers are. They can exhibit less uniform surface shine, too, with unprinted or white areas shinier than areas that have been heavily covered with ink. Pigmented inks are naturally more resistant to fading because the colour is sealed into microscopic solid particles, sometimes individually coated with a protective polymer layer. Unlike dyes, pigmented inks lie on the surface of the media that they have been printed onto instead of being absorbed. If the media has a high shine, pigmented inks can cause the shine to be dulled where there is a lot of ink laid down, causing an unpleasant variable shine effect. Some pigment ink printers have a solution to this, variously called a gloss optimiser. This means the print has a uniform layer of ink, with clear ink being printed over areas that need little or no coloured ink. Pigmented inks dry more slowly than dyes, but they are more suitable for printing on matt or plain paper surfaces, producing sharper details and deeper colours. Combined with specially coated papers made from high-quality wood pulp or cotton fibres, pigmented inkjet printers are the printers of choice among professional photographers producing so-called giclée prints for public exhibition or for archival work.